1 of 3 In a small bowl, whisk together lime juice, olive oil, sour cream, chili powder, cumin and pepper. Set aside. 2 of 3 Heat rice in microwave following package directions, about 2 minutes; add to a large bowl. Add cheese and stir until melted. Stir in surimi, green pepper and scallions. Add lime juice mixture and stir to coat all ingredients. 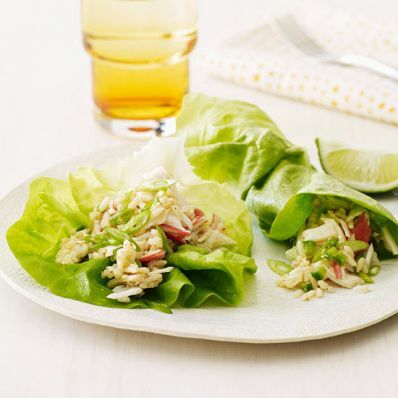 3 of 3 Serve rice salad with lettuce leaves for wrapping. Squeeze with lime wedges, if desired.